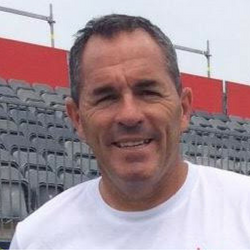 Roberto is one of Tennis Canada’s top National Coaches and co-runs the Western National Junior High Performance Program with Oded Jacob. He moved to Vancouver in September 2015 from the National Training Centre in Montreal where he has worked since 2007, training many of Canada’s top juniors including Françoise Abanda, Carol Zhao and Genie Bouchard. Roberto led Canadian Womens’ team to a gold medal in the 2015 Pan Am Games. Roberto has worked with many top ATP and WTA players including Harel Levy, Anna Smashnova, Jonathan Erlich and Andy Ram as well as Grand Slam champion and former World No. 1 Marat Safin. He has coached many of Italy’s best tennis prospects, the Uzbekistan Davis Cup team and their top juniors, and also also served as the tennis and fitness coach for the Chinese women’s national tennis team which included Li Na.